Hasan Minhaj has officially joined the crowded landscape of news-driven comedy shows. Some of these topical shows have thrived, while others have withered away after brief stints. Can the former “Daily Show” correspondent crack the code with his new Netflix show, “Patriot Act”? Minhaj’s show – which premiered with two episodes Sunday but will continue at an episode-a-week pace – naturally shares a lot of qualities with other comedians’ shows. But here are a few ways “Patriot Act” departs from the pack. The approach is somewhat reminiscent of HBO’s “Last Week Tonight with John Oliver,” which focuses on one big story for the majority of its show, with a heavily researched monologue. Minhaj is serious, but not caustic. He’s incredulous at times, but mostly in a can-you-believe-how-crazy-this-is way. He adds laugh lines where you wouldn’t necessarily expect them. But it also doesn’t feel like the entire point is to just make you laugh for 20 minutes – the jokes often are in service of the information, rather than the other way around. 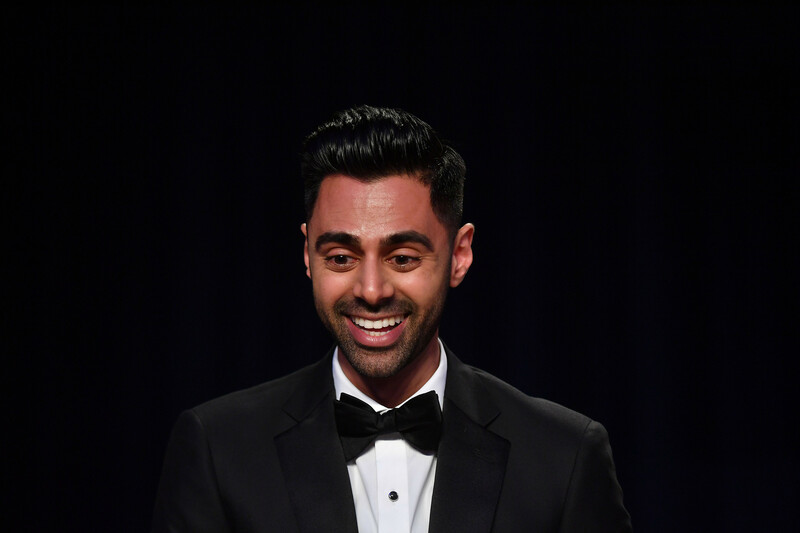 Minhaj has had several career breakout moments, including his 2017 Netflix special “Homecoming King,” in which he laced jokes into the story of his life growing up as the child of Indian, Muslim immigrants in America. The deeply personal special ended up winning a Peabody Award, and with “Patriot Act,” Minhaj continues to lean into his identity where it makes sense as he breaks down topics like affirmative action and the U.S. relationship with Saudi Arabia. Minhaj also stands out in an industry where the majority of these comedy shows are hosted by white men (there are some notable exceptions, such as Trevor Noah on Comedy Central’s “The Daily Show,” Samantha Bee’s “Full Frontal” on TBS and Sarah Silverman’s “I Love You, America” on Hulu). Minhaj is not wearing a suit, and he’s not sitting behind a desk – shoot, he’s not even sitting down. “Patriot Act” features Minhaj jumping around the stage, gesticulating and driving his points home with the aid of what feels like a wraparound graphics wall. He jokes in the first episode that the audience members were due for “a woke TED Talk” and, you know, it doesn’t feel that far off. The use of graphics isn’t new for Minhaj: He incorporated photos, charts and maps into “Homecoming King,” and his weekly show features a similar kind of kinetic energy as the special. Although the company is notoriously secretive about its streaming data, we feel it’s safe to assume a lot of people go to Netflix to binge shows. But a handful of comics have tried shows that release one new episode a week. Chelsea Handler’s talk show, which first rolled out three episodes weekly before switching to one a week, ended last year after two seasons. And Minhaj’s show comes just months after Netflix pulled the plug on two other topical comedy shows after just one season: “The Joel McHale Show,” which logged 19 episodes, and Michelle Wolf’s “The Break,” which only made 10. Deadline, citing anonymous sources, attributed the cancellation to less-than-stellar viewership numbers. But Netflix appears to have had more success – or patience – with interview-driven shows hosted by comedians that get released in blocks, such as David Letterman’s “My Next Guest Needs No Introduction” and Jerry Seinfeld’s “Comedians in Cars Getting Coffee” (which lived on Cracklebefore it came to Netflix). As for Minhaj, he has said being on Netflix helped him figure out what topics to tackle. “We’ve designed this show to thrive on Netflix as a platform,” he told Uproxx. “Honestly, to me, the medium is the message. I understand that people who use Netflix as a platform will often dive in at any point in time. Sometimes they dive in with great urgency, like, ‘I need to see that thing right now! It just came out!’ Other times, they’ll revisit things a month later because of how great their friends say it was. Shows, documentaries and things like that. With the way that I tell stories, I want things to always feel urgent and timeless.